Now that is what I would call a great non-violent direct action! 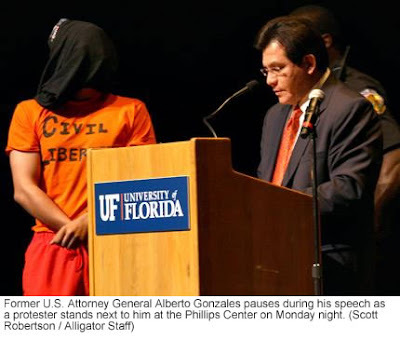 Students at the University of Florida, where I went to school in Gainesville, did a great action last Monday night as Alberto Gonzales came to spread his corrupt garbage before the student body. It's obvious that Gonzales is now going out on the speaking circuit trying to "make some money" off his years of destroying the Constitution. It was reported on NPR that he was paid $40,000 for the speech and did not take any questions from the audience. Click on the link in the headline above for the video version of this action. Also, there is an article from the student newspaper, The Alligator, that is quite good. It's good to see G-ville is standing for more than just sports these days (the University of Florida Gators were the national champs in college football and basketball last year). So Go Gators! Keep it up. We need ya now more than ever. Each year the Space Command performs a war game set in 2016. In that war game the new military space plane, the Falcon, flies across the planet at six times the speed of sound and delivers 12,000 pound bombs against the "Red" team. Red team means China in Pentagon language. The Falcon, a reusable "hypersonic vehicle," would cruise at 28 miles above the Earth and would also be able to deliver 1,000 pound penetrator bombs and independent "kill gliders." Bottom line is that the Falcon would be a first-strike attack weapon. The fact that the Space Command is now rehearsing a first-strike attack on China should cause alarms to be going off. At the same time the Navy is deploying Aegis destroyers just off the coast of China outfitted with "missile defense" systems. Just in case China was to launch one of its 20 nuclear weapons capable of hitting the U.S. west coast during the Pentagon's first-strike attack, the Aegis system's job would be to pick the Chinese nuke off right after launch. This new "global strike" technology development is all being coordinated by StratCom in Omaha, Nebraska that is now in charge of the Space Command and all first-strike planning. A first flight test of the Falcon is scheduled for next year. I've been working on our Global Network newsletter, Space Alert, the last week. We collected articles from key members in the U.S. and around the world. It's being laid out now and should go to the printer on Friday and then to mailing house on Monday. It's always a big task to get it done but I think it will be an interesting issue. Much of the newsletter of course centers on reports from activists who have been working hard to deal with the space technology issue. It is quite remarkable the work that is being done to educate folks about the new arms race in space and you can see the expanding international movement right before you eyes. It does give one some sense of satisfaction and pride, even if hope is a bit farther down the road. As I step back and look at the newsletter, and the U.S. foreign policy that is driving the use of space technology, virtually all the major tensions and conflicts are related to fossil fuels. There is no escaping this reality. The way we burn energy in this world, and particularly in the "first world," creates the need to control and dominate. 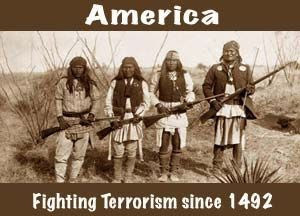 The fact that Germany and France, with their new right-wing governments, has come onto Bush's side concerning the likely attack on Iran illustrates this reality. Even though those countries are doing so much more than the U.S. to invest in energy conservation and alternative technologies, their economies are still largely run on fossil fuels. Thus they play hardball with Bush. Some parts of the world are not in the game at all. And frankly they are better off for it. In some senses they are more able to deal with the coming economic grind that will hit the U.S. when our totally energy dependent lifestyle hits the wall. Our local papers, even in recent days, are signaling a near panic at the highest levels of Maine governing bodies as working class and poor people are now not able to afford the 20% increase, since last winter, in the cost of home heating fuel. There will be some real pain in Maine this winter. I've been trying to sell my car lately but the bites are few as most people are not in the buying mood. Money is tight and folks are hanging onto what they've got. 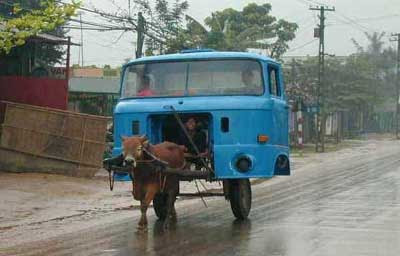 Soon, I think, we'll see more creative adaptations as you see in the photo above. Hang onto your hats. The winds of change are blowing strong.